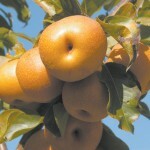 Pears must be picked just before they are ripe so they will develop full size and ripen the rest of the way. As spring follows through summer and then onto fall, gardeners think of harvests — particularly the succession of fruit harvests. Strawberries lead to cherries and apricots, then peaches, pears and apples. There is plenty else in between, but fruit harvest times are as dependable as the seasons. Picking pears at the right moment is important. We celebrate the joys of tree-ripened apricots, peaches and apples, knowing that they will have developed the best flavor possible. Pears are the exception to the rule. They must be picked just before they are ripe so they will develop full size and ripen the rest of the way. Pick them while they are still green — but not too green. For fresh eating from the grocery store, riper ones are OK, but they become soft, fragile and easy to bruise as they ripen. Thursday’s article will go into the details of pear picking. Suffice it to say, however, that if you are in the market for pears for canning, you may want to find those that are still green as well and bring them home to finish ripening. As they gradually turn yellow, they become sweet and delicious. Most people either eat them plain or preserve them for later use. They make delicious jams and jellies although they are less commonly used than other fruits. They are low in fat, cholesterol and sodium and are a good source of vitamin C (10 percent of the Recommended Daily Allowance). 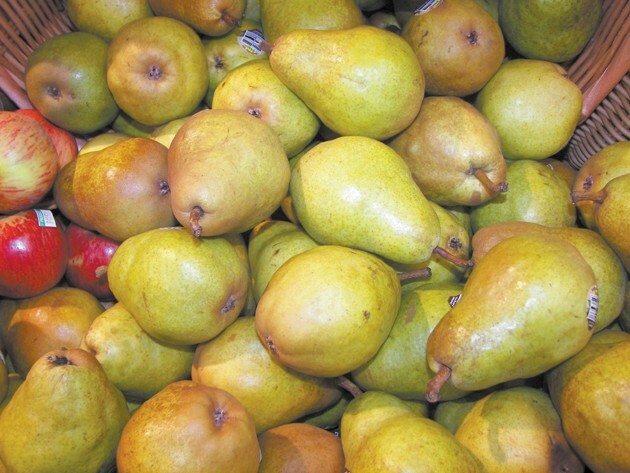 Pears are also a good source of dietary fiber — particularly if you eat the skin along with the inside flesh. Recent studies have found that the skin of pears contain three to four times as many phonemic phytonutrients as the flesh. These have antioxidant and anti-inflammatory flavonoids and possibly anti-cancer phytonutrients. Pears are a favorite home-bottled fruit. Use a USDA-tested recipe and do not over-cook as it turns them pink and they don’t taste as good. Pears make a tasty dried fruit, but you should treat them with ascorbic acid to help maintain their color or they turn very dark. Freeze pears in a sugar syrup — 3 cups sugar to 4 cups water, bring to a boil and let cool. Cut up the pears and put them into an ascorbic acid solution. Blanch them for two minutes and then plunge them into cold water. 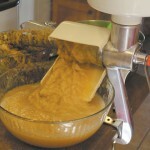 Place in syrup in rigid containers and freeze them for good winter eating. There are many ways to use fresh pears. Eat them out-of-hand like you might enjoy an apple. Because they become juicy, you might like the daintier method of slicing them to eat. Before or after they are canned, they make a very quick, tasty and nice looking salad. Place a half pear on a piece of lettuce on a plate, top with a dollop of cottage cheese and garnish with finely-grated cheddar cheese or paprika. 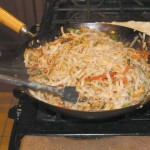 Birchermusli is a great, filling and nourishing breakfast food. It is a source of cereal as well as fruit and milk. If you like baked apples, you might like Pears with caramel sauce, a version of baked pears. The use of the microwave hastens the process. Prepare the pears in advance and eat them with whipped cream or refrigerate them, then make the quick caramel sauce for a flavorful topping to serve them. Into the larger of two containers, put the following. Pour the mixed fruit into the base and stir together. Let stand eight to ten hours for best flavor. If refrigerated, it will keep for several days. In oblong baking dish, arrange pears; sprinkle with water. Heat, covered on high 8 to 9 minutes or until pears are tender. Cool or chill.